By clicking "Next" button below as my electronic signature, I expressly consent to being contacted by davison-invention.com advertisers including Davison by phone call, auto-dialed phone call including prerecorded voice messages, text messages, or email at any number or email address I provide. I understand that my consent is not a requirement for purchase of services. I understand that the product idea information I submit cannot be used, disclosed, or sold without my express written permission. I also understand that all Davison employees are required to sign an ethics and confidentiality agreement for my protection. I believe that I am the original inventor of the idea described herein. I authorize Davison to review my idea and contact me in 3 to 5 business days to give me a no-cost consultation about my idea. I acknowledge that Davison monitors and records telephone calls for quality assurance. I understand that Davison does not promise any financial gain from the development of any new product idea. Davison has been helping individuals with their product ideas for over 20 years. We design and develop working product samples and present them to corporations. Congratulations! Your information has been submitted. You will be contacted shortly to begin the process of making your invention idea a reality. Your information is confidential so please answer the questions as thoroughly as possible for the best results. 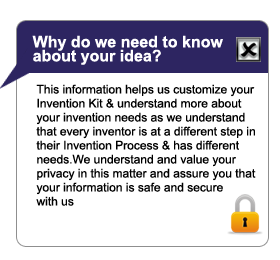 You can ask the invention specialist any questions you may have with regards to your invention idea. Good luck with your invention process!